An Interview with David McMillan, writer of WATCHING O.J. – a World Premiere at Ensemble Studio Theatre/LA – Opening October 3rd. A double murder case, it unfolded like a Hollywood movie. It was October 3, 1995. Everybody remembers where they were on that day, when the verdict was announced. In the wide cross-section of L.A.’s diverse population, tensions ran high as people awaited, and watched. Twenty years to the day, David McMillan’s new play returns to the scene with a passionate, multi-racial perspective on that crucial moment. 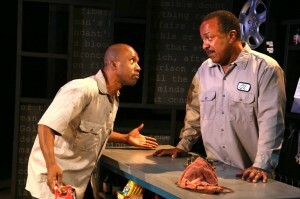 As the play’s characters patronize their local cleaners and neighboring businesses, a volatile discussion about race and social class bubbles to the surface, one that is more relevant now than ever. David McMillan is a Los Angeles playwright, screenwriter, and filmmaker. His writing credits include Fox’s “Sleepy Hollow,” the upcoming Fox show “Lucifer,” and a new pilot that he’s developing with producer Will Packer for NBC. 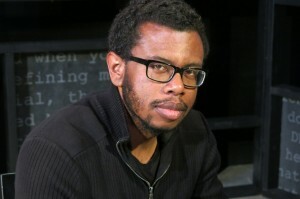 David has received several awards for his work, including USC’s top prize for screenwriting. Ensemble Studio Theatre/LA presents the World Premiere of “Watching O.J.” which is opening exactly 20 years to the day of the criminal trial verdict. Hollywood Revealed: Why did the O.J. Simpson double murder trial have such a lasting impression on you? David: As black teenager, growing up in Inglewood, I was fascinated by how people were watching the trial, through their own distinct racial, cultural, and historical lens. It wasn’t so much the events as it was everybody’s perception of the events. Even now, “the facts” of the case are often beside the point — what’s illuminating is how we look at those facts. Hollywood Revealed: Is your new play fictional or sort of a recap of your experience at the time? David: The locale and characters are fictional, however they’re very much based on people I know, and some of my own experiences. I vividly remember the trial, the emotions it stirred, the conversations it provoked. 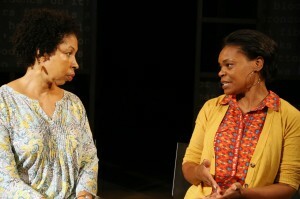 So while it’s not “autobiographical,” the play is very much a creative snapshot of my memories of that time. That said, people who know me will say that they can see a few of my family members in some of the characters (glimpses of my mom and dad in particular). I won’t try to deny it — some influences you just can’t escape. Hollywood Revealed: Will you talk about the process of getting this play started, and if it is a common way that you work. David: Honestly, every project starts out differently. Sometimes it’s a character, sometime it’s a situation/set-up, and sometimes it’s an idea. For “Watching O.J.” it was really the idea that first inspired me. I liked the idea of using the O.J. 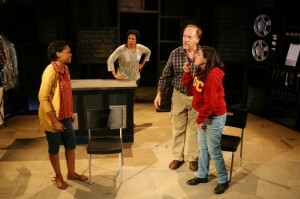 trial as a dramatic backdrop/catalyst for exploring racial tensions in America. I didn’t have any of the characters at that point — I discovered those later (or maybe I should say, they discovered me). It’s a messy process — and to be honest, I wish it were less messy. I wish I could just come up with a premise, outline it from beginning to end, write it, and then voila — the play is finished. But I’ve come to learn that creativity, and writing a play in particular, is a lot more complicated than that. You write, you re-write, you get feedback, you re-think, and then you write and write and re-write some more. And eventually, if you’re lucky, the world gets to see it. Hollywood Revealed: Exactly 20 years from the announcement of the criminal trial verdict, your play opens. Was that the plan from the start? David: Wish I could say yes, but it’s really more like a confluence of happy accidents. The script was ready, and we were able to assemble an extraordinary cast that was available, and Keith Szarabajka, the director, was between television projects. So it worked out great, beyond what anyone could have hoped for. The cast includes Lisa Renee Pitts (Straight Outta Compton – as Dre’s mom), Robert Gossett (Broadway – Fences, A Raisin in the Sun, and The Last Minstrel Show. Currently in the TNT’s Major Crimes as Chief Taylor reprising the role he created in The Closer), Angela Bullock, Kareem Ferguson, Robert Gossett, Tony Pasqualini, Tarah Pollock, Eve Sigall, Roy Vongtama, and Kelly Wolf.